Sealed 12″ of ‘Justine and The Victorian Punks’, signed by colette with drawing by her to cover. Three invitations, two postcards, one folded program, one envelope and RSVP, one deadly feminine tag. Beautiful dreamer was later reissued by DFA. Colette is a complex persona created by Colette Justine to incorporate fine art practice, music and performance. Her most notable piece was a staging of her own death at The Witney- shortly folled by her resurrection at PS1 some days later as Justine and the Victorian Punks. 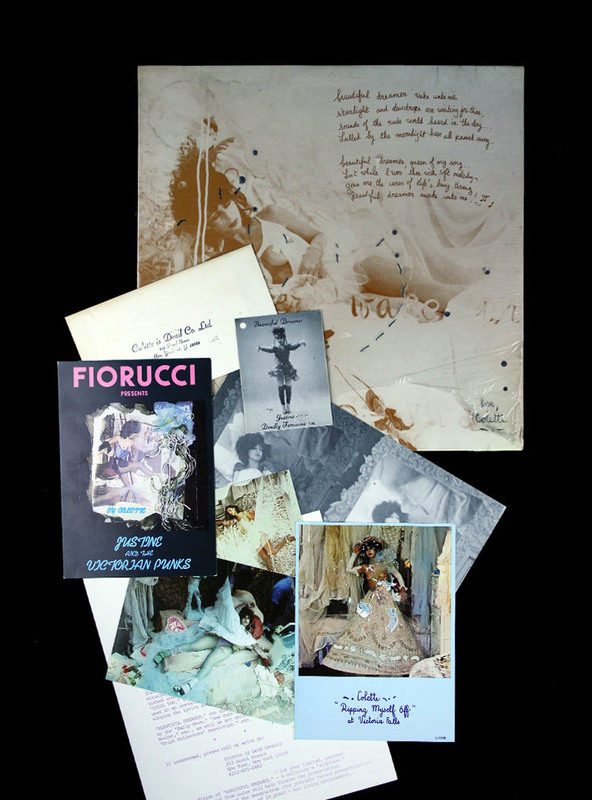 The collection here comprises her private press single ‘Justine and the Victorian Punks’, which was made with Peter Gordon and pressed in an edition of 1000 with 150 being signed and with drawing by Colette, invitation to her first solo show ‘Clocktower’, 3 postcards from her Fiorucci window performance, a handbill and mailer in envelope for ‘Beautiful Dreamer’, a tag from her short lived beatiful dreamer clothing line made for Fiorucci and an invitation for ‘ripping myself off’ which was presented at Victoria Falls gallery on Spring St.